"The story goes that an Olympian world-champion ski racer was out skiing with his son. Son had on a pair of kid's skis with Mickey Mouse graphics, and Son was horsing the skis around the turns with lots of body movements and arm swinging. Dad said, "Now, Son, let Mickey do the work!" It is said that at the end of a ski day, your skis should be tired from working, not you. For a fun demonstration of how and why this works, see the one-minute video "PSIAman" at https://vimeo.com/9872613. In this a little stick figure with a swinging torso continues carving turns once started downhill, powered only be natural forces (thanks to Bob Barnes and Jerry Berg). In the snow/skis/skier system, note that the skis come between the snow and the skier. Once on a given area of snow, the skier can't do a lot about its character, and the skier is pretty much stuck to the skis by the boots and bindings. So if the skier is to influence what is to happen, it has to be by somehow positioning the skis so they will interact with the snow and make the skier go this way or that, and faster or slower. We all know generally what skis look like, but take a close look. "What is the most important part of the ski?" is a question sometimes asked in ski instructors' exams when they try out for certification. This is a loaded question. Anyone who has broken a ski tip (or feared to) while out in the woods will say the upturned end, or shovel, is the most important, for it allows the ski to run up over obstacles instead of diving into them. Note the lengthwise bend of the tipped skis, especially the skis on the outsides of the turns. A skier also knows that the sides, or edges, of the skis are crucial. A ski that is flat on a snow slope will slide where gravity pulls it, directly down the slope When a ski is tipped on its side, however, its edges indent the snow, keeping the ski from sliding directly downhill--and if we are on it perhaps getting us to slide where we want. The edges are even lined with more-or-less squared-off steel to help them bite into the snow better. Some advanced skiers might not notice what more expert skiers should about another ski characteristic. Look down on a ski's top surface from above. 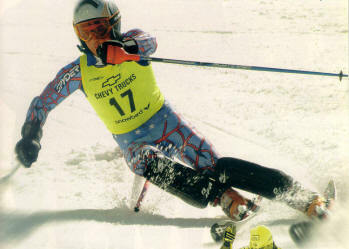 Notice the ski is narrower under the foot area than at its tip or tail. This is side camber. Why is the ski made like this? Setting the ski on the floor again, bottom down, first lift up one side of the ski. This will put the ski at an angle to the floor. Now, keeping the ski angled to the floor, and ensuring the tip and tail don't slide on the floor, press downward on the ski's middle, causing the ski to bend until the lower side of the ski touches the floor. If you followed these directions, and your ski is normal, the ski's line of contact on the floor will be an arc. The more you tilt the ski to a higher angle with the floor, the more of an arc you will get when you press the middle down again. Now do the same thing but on a rug. While still holding the ski so the arced edge presses against the floor, push the ski forward and watch the ski track along its edge in an arc. This shows how a tilted ski can turn us more or less depending on its tilt and therefore how much it can bend into an arc. (Be careful not to cut the rug!) If your rug has a bit of depth, it will be like snow in that the higher the ski is tilted, the more of its weight is put on a smaller area, increasing pressure on the edge of the ski and causing it to bite into the rug--or snow--more deeply. "People ask us all the time about the width of skis... Will a wider ski perform well on groomed terrain? Will I be able to turn a wide ski? Are these skis only made for deep snow? Skis waist width has been creeping wider over the last few years offering skiers a variety of wider platform choices. With so many wider ski options its hard to believe that so many skiers still haven't made the switch. A long time skiers initial thought seems to be... "Those look like waterskis!". Turn initiation and quickness edge to edge may present more of a challenge by being on a wider platform, but its not as difficult as you may think. Added float is a huge benefit of having a wider ski. Whether its fresh powder or spring time slush, the greater amount of surface area will blast right over it. The construction quality of wider skis has improved drastically over the last few years. The skis are designed with deeper sidecuts in the shovel, or the tip of the ski, for easy turn initiation. Torsional rigidity has also improved dramatically since the conception of wider skis. With better torsional stiffness wider skis perform exceptionally well on groomed and hardpack conditions. The torsional stiffness decreases chatter at higher speeds, and allows the ski to have increased edge hold on hardpack snow. Another huge advancement in the progression of wide skis are the ski bindings. Manufacturers are now making bindings specifically designed for wide skis. These bindings are wider and more rigid laterally making it easier to roll the ski edge to edge and more compact allowing the ski to have more flex. 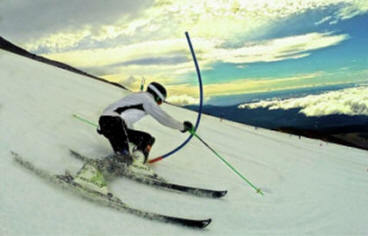 They also raise the skier higher off the snow allowing for more leverage to engage the ski. The way the wide-ride binding grips the boot adds for a increased level of responsiveness, when a skier is transferring from one edge to another. Marker has done an awesome job of designing their "Royal Family" of bindings including the Marker Jester and Marker Griffon. But now for an alternate view: Depending on the snow one is on or in, one may or may not need extra flotation from a wide ski. On groomed snow it will take a little longer to move the ski from one edge to the other and even though materials have improved to provide better torsional stiffness, a less-wide ski will still have greater torsional stiffness than a wider one. So decide on your own what you would like and consider a narrower ski for most groomed- or packed-snow surfaces, but if you are in powder much, at least have a wider ski somewhere in your quiver. And has this wide-ski craze been partly a fad? Read this from Ski for September 2015, page 46 "The Rise and Fall of the Fatties": "There's mounting evidence that superfat powder pigs have had their day...'There are still a lot of fat skis sitting on retailers' walls from tow and three years ago', says Fischer's Matt Berkowitz. 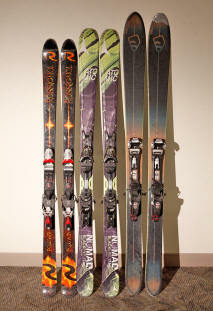 Skis with 80- to 90-mm waits remain the hottest sellers, and the fastest-growing segment is 101-110 mm." HOW BALANCE MAKES SKIS WORK. While learning "How Skis Work", we kept the skis on a flat floor. That's not where we use skis, however. We use them on hillsides. To make the skis work the way they are designed to, then, we must position our bodies to produce the same forces as in the flat-floor example. Our forces must be centered on the skis and perpendicular to them, no matter how the skis may slope or tilt. Imagine the gyrations we must do in our bodies to always have our main line of force perpendicular to our skis--especially when the skis are tilted. If the skis are flat to the snow and going down a steep slope, for instance, our bodies must be tilted forward from vertical. If the skis are tilted to the side, our lower legs must also tilt to the side, and somehow we must keep from falling over. To assume such positions is not possible while standing still in normal gravity mode. Only while we are moving and new forces of motion come into play can we manage to place ourselves in seemingly gravity-defying postures. Perhaps this is a little like a car going around a curve at high speed; the road-builders often bank up the roadway on one side so the car tilts inward from vertical but stays more nearly perpendicular to the road surface, and is less likely to fly off the curve's outside. And so when we speak of balance in skiing, we are not talking of the more usual balance against just gravity, but a much more complex and dynamic type. Learning these new balance positions and experimenting with them constitutes both the joy and the frustrations of learning to ski. For those who enjoy motion, the journey is always fun. 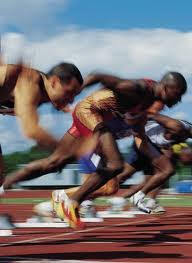 For some, however, who do not overcome a distaste, or even fear, of sliding, the journey will be more limited. One beginning skier confided to her instructor, "It's the sliding part I don't like." There is a lot of humor in her utterance, yet most skiers in spite of their efforts to overcome, at some point will find that it's fear of "the sliding part" that ultimately limits their advance in skiing. That skier inadvertently gave the name of this skiing web manual. SHOULD WE EVER BE OUT OF BALANCE? "No!" says conventional wisdom. But consider how we learn to walk: moving a foot forward does not get us to walk; we have to also tip forward as the foot is moved forward, starting to fall while at the same time swinging the leg so the foot gets under where the weight is going, thus moving a support forward so we don't fall. With practice we got so good at this most have forgotten how this works but we can watch toddlers to remind us how we walk. At first, beginning walkers may swing a foot and its leg forward without first tipping their tops forward, causing them to fall backwards. Watch runners: their upper bodies are ahead of their lower bodies and they are tilted forward, with their legs rapidly moving ahead from behind--especially true as they accelerate, less so when they are at speed. On skis, therefore, if we simply remain balanced against all the forces upon us--gravity, deflection of skis against snow, and perhaps wind--our skis will keep doing what they have been and so will we keep doing what we have been. To change our direction or speed, we must rearrange the forces on our skis by changing the rotary force we apply to the skis and/or how we tilt or pressure them. We make these changes ourselves. If we do not make the changes, the ski will respond to whatever other forces, tilts, and pressures occur anyway and we may be surprised at results. As our skill to do this rearranging increases, so also does our ability to manage ourselves on various ski slopes and snow textures. 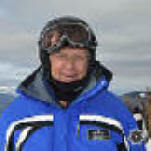 The wise skier said, "In skiing, there are things (positions, movements, pressures) that we create and things that we allow; we should not create those things we could and should allow." This "How Skis Work" page last modified 11/03/2017 07:21:40 AM. Did you come here from a link on another website? For latest version of this page, copy to your browser: http://www.SkiMyBest.com/skihowsk.htm. Copyright © 2016, 2017. William R Jones.